I’ve pretty much made my peace with Thomas Keller since starting to regularly make his vegetable stock (as described here). I accept that he is the world’s worst home economist, always urging you to toss away things that frugal housewives would carefully hoard and use to their last bit of life. I accept that he is more particular than I will ever be about straining and clarifying, and that he will always add a step of work if there is the teeniest bit of value to be gained from it. So I make his vegetable stock the way he makes it, and strain out my pricey leeks and fennel after 45 minutes like he says to, and then when he’s left the room, I simmer the vegetables some more and get from them the flavor he would have left behind, because it wasn’t quite pristine and clear enough for him, and then I have two vegetable stocks— a beautiful clear-tasting Keller one for delicate soups, and a slightly down-and-dirtier one for not so delicate ones, and each jar of vegetable stock cost me a buck or two, not three bucks or four. Everybody’s happy. Well, until Keller came out with what was supposed to be his casual home cooking cookbook, Ad Hoc at Home. Somehow, not remembering my failed attempts to cook out of The French Laundry Cookbook, I convinced myself that it was not only a cookbook I wanted to have, but it would be a worthy Christmas gift for my sister, who’s a fine cook but let’s just say about 10,000 times less hyper about food than I am. I snapped back to reality when Aschie30 wrote this LTHForum post about how difficult Keller makes the act of making something as simple and homey as chicken and dumplings. True, she finally decides that all the extra work was worth it, but in the process she certainly puts the lie to Keller’s opening claims that this is the casual food “I love to sit down to with my family and friends.” Charlie Trotter successfully put away the chive shears and managed to produce a book of modestly-scaled recipes which achieve his cuisine’s baseline virtues without a staff of 20, but Keller has not. I mean, this is a book which devotes an entire oversized spread to making your own soup crackers. Keller writes a book for casual home cooking like Wagner would have written one on musical entertaining at home. At the risk of discovering that the main thing I’d strained was my family’s patience, I decided to have an all-Thomas Keller Valentine’s Day dinner, and thus settle the question in my mind: does Keller’s perfectionist approach to casual cuisine yield benefits worth sweating for, or is he freakin’ nuts? (It would have been an all-Ad Hoc at Home dinner, but I finally decided I liked the sound of a dessert from The French Laundry Cookbook better.) But in any case it involved four main recipes from Ad Hoc, plus two additional recipes which produced something to be used in one of the main recipes; plus four separate recipes to produce the parts which would come together to make the dessert. And in typical Keller fashion, given his belief that vegetables have given up most of their flavor by the 45-minute mark, this is just the first of two sets of nearly identical vegetables and spices that you add to the braising liquid— throwing both away at the end. Nonsense, said I, and so I rescued the second set of carrots at the end and served them alongside the meat. They were fine, you should try them sometime, Tom! 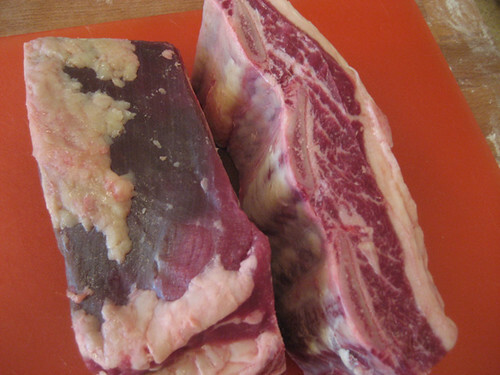 Meanwhile, I browned the short ribs, and then, because Keller is so horrified by the prospect that meat might wind up with a little piece of limp parsley adhering to it, you’re supposed to wrap the meat in a shroud of cheesecloth and bury it in the liquid. I did that, then cut out the little parchment paper doily that is another of Keller’s signatures, and put this in the oven to braise for a couple of hours. Put some garlic cloves in a pan, cover with half a bottle of canola oil, poach in the oil until they’re soft and gooey. 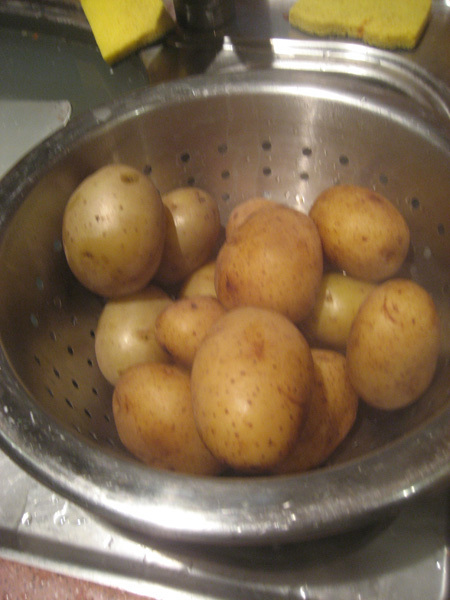 The two bucks’ worth of canola oil seemed profligate— though I suppose it could be used later in something— but the resulting garlic was really nice and mellow, subtle once it was mixed into the potatoes. And not much work, really, for a Keller extra step. I would do this again, certainly. I hadn’t planned on making anything from his book breadwise, but then I spotted the brioche recipe, which is actually rather easy (if you have a Kitchenaid mixer) and though the quantity it makes is fairly huge, I knew there would be another use I could make of much of it, which I’ll post about separately. 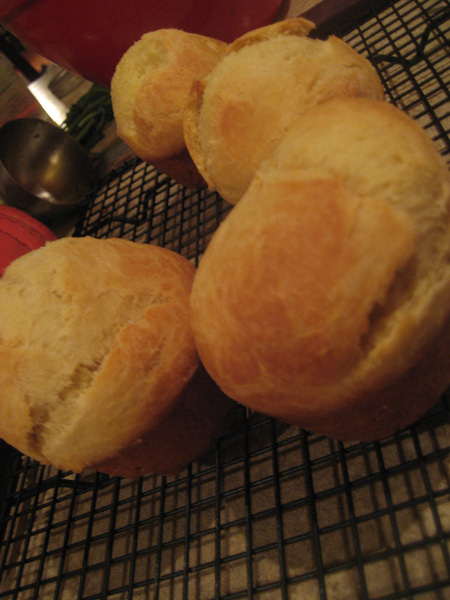 So I used some of it to bake round brioches in a muffin tin. The kids loved the buttery bread. 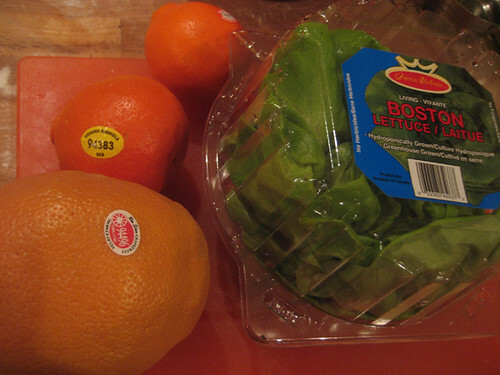 One of the things that I came to find frustrating about looking through the book was that Keller would often be quite specific about the fruits or vegetables he wanted you to use— for instance, this salad requires Little Gem lettuce, Ruby Red grapefruit, blood oranges (at least he didn’t specify Sanguinellos over Moros), Satsuma oranges and a pomegranate. Well, that’s fine and dandy if you’re Thomas Keller and can basically get your hands on anything with a phone call, but here I am in a major city and the closest I came at my local Whole Foods was a Rio Star grapefruit (at least I knew that would be similarly sweet), blood oranges, no pomegranates (but I finally found a lone box of pomegranate pips), and some tangerines (actually, I later realized that WF had a small bunch of Satsumas, when I remembered what they were— the little oranges with dark green leaves— but the sign for them was missing). As for the lettuce, only because of a passing reference to Little Gem being like butter lettuce was I able to find something that would substitute reasonably well— I assume. This is annoying not only because it’s unrealistic, to think that the shopper even in a major city will be able to find all of these things at once, but because you can’t believe it’s how Keller would really assemble a dish— he’d see what was available and adjust accordingly, making things a little more sweet or tart based on what he could find. And even the slightest clues as to how to do that myself would be of far more use than telling me that I have to find some specific lettuce variety that may be easy to have trucked over to your restaurant in Napa, but which I’ve never seen in my life. That complaint registered… this is a fantastic salad. 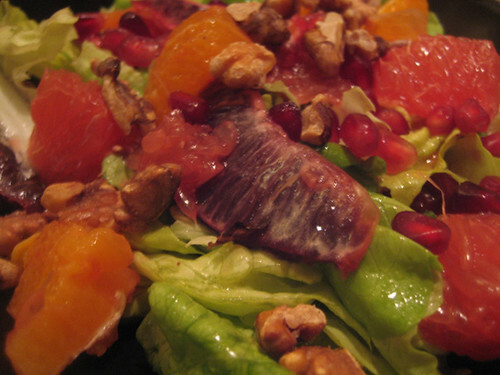 Maybe I just lucked out and despite having the wrong grapefruit, the wrong tangerine, etc., the balance was pretty much perfect anyway, but the sunny juiciness of the fruit and the tart note of the vinaigrette and the tenderness of the lettuce— just wonderful, especially at this time of year. Even my sons, whose ideas about salad are pretty much that they like ranch dressing and NOTHING ELSE, gobbled it up. This will undoubtedly be a keeper… and I will undoubtedly evolve its mix of flavors depending on what I find in the store from one time to the next. Meanwhile the meat seemed tender— well, the middle parts seemed tender; the upper stripe of meat was either over or undercooked, I frankly couldn’t tell with this grassfed meat— and so it went into a pan in the oven while I reduced much of the sauce to a glaze. So the grass-fed beef: good rich flavor, I need more experience braising it to really know how to do it right, but on the whole I was happy with it this way. 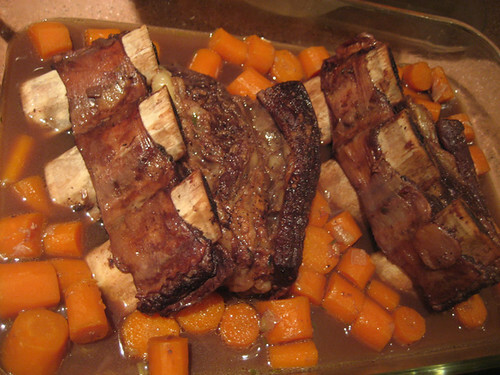 That said, I can’t say that I particularly thought all the little Keller touches— making the wine glaze first, then the braising liquid with stock, putting the doily on top, etc.— added up to much, I made just as nice a short ribs braise from The Balthazar Cookbook with less fuss. So final score for dinner from Ad Hoc at Home: salad great, brioche fine, potatoes worth the effort of making the garlic confit if not the pain of peeling unskinned, boiled potatoes, braised shortribs fine but no great difference from anybody else’s recipe for a dish like that. This was a satisfying recipe first of all because you could methodically prepare its parts over the preceding week without the stress of a last minute rush to get it made. The velouté is sort of somewhere between a mousse and a meringue, and you make it in plastic wrap inside a ramekin or other round object and freeze it. The ice cream you see underneath it below is cinnamon ice cream, made by steeping a stick in your custard; it’s subtle, almost ethereally cinnamony. 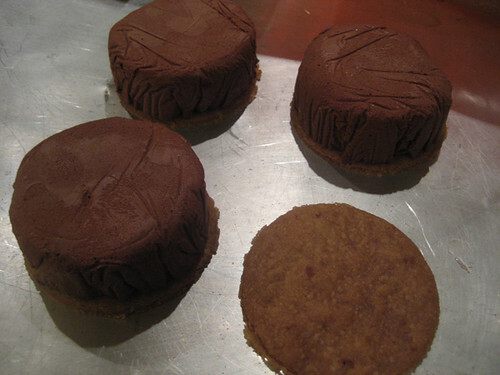 The flat disc is a cinnamon cookie, which you par-bake a day or two before. 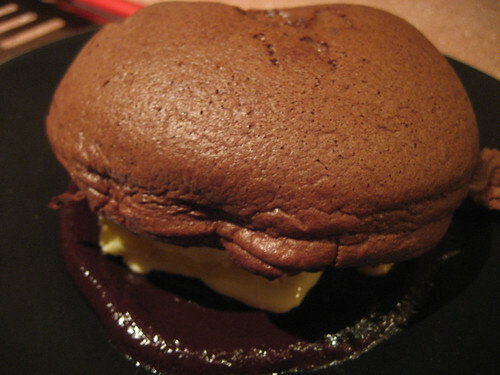 At the bottom is a basic chocolate sauce. When the time comes you bake the veloute on top of the cookie until it’s got an outer skin and a gooey inside, then assemble it quickly. This is another great recipe, an easy way to wow your crowd; it looks complex but really it’s no harder to put together than a cheeseburger. Ironically, I don’t think a recipe like this would have made it into Ad Hoc at Home, it’s too restaurant-showy, yet designed as it is for efficient production in a busy kitchen, it’s actually easier, and even more practical perhaps, for the home cook than many of the recipes in Ad Hoc at Home which take something simple and then fuss and fret it into a lot of extra work. So where did I come out of all this on the subject of Thomas Keller? I think there’s a lot of value in going through his overelaborated ways of making things, because it forces you to think about what goes into your dish, where extra efforts are worth it and where shortcuts are shortchanging you. I think you will often decide that Keller is overdoing it for not enough return— but not always; here and there his way of doing it really is a better way, a way that takes an old familiar dish to the next level. In a world where most cookbooks promise ease, there’s something to said for the master who challenges you to try harder and do more. You may not always like his book, but you will learn a lot from it— including what matters more to you in the kitchen, time or perfection. I’ve been making a lot of dishes from Ad Hoc lately. Certain steps are clearly unnecessary if you don’t have the time, so I just skip them. If I happen to have the time, I go ahead and indulge my culinary desire. It can be fun. My wife Laura has fallen in love with the “technique” aspect of the book and has taken to advising me in various preparations. I never knew Keller’s advice on the proper uses of olive oil. I’ve apparently been wasting my money and adding a burnt flavor by cooking on the stovetop with it. All in all, I find it a wonderfully satisfying book in design, writing style and cooking. I haven’t read Ad Hoc yet so thank you for preparing me for the worst. I’m the type who freezes parsley stalks and potato peelings for future soup stock, so I just cringed my way through the descriptions of feeding the garbage can. Bravo for re-purposing the vegetables and using up the left-over wine. Very interesting read, Mike. 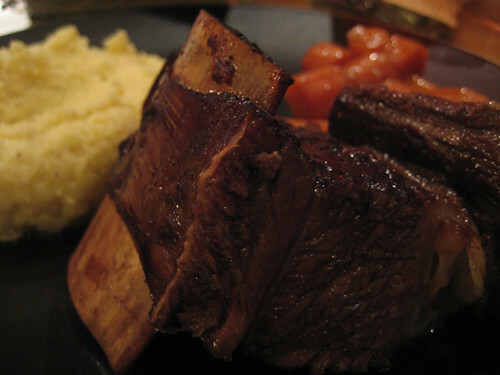 There’s a lot of silliness here, but wrapping the short ribs in cheese cloth takes the cake. That really cracked me up. I still really, really want this book, but I’ll definitely remember all your awesome advice, and that even Keller can be taken with a grain of salt! Thanks for a great read. I moved to San Francisco from Chicago not long ago and can feel your pain in tracking down Keller’s required produce. A friend had to explain what Little Gem lettuce was to me one night at dinner when I saw it on the menu at local restaurant. Cheers to you for saving those carrots! I made Thomas Keller’s recipe for boeuf bourguignon from the French Laundry cookbook for a special occasion. I, too, cringed at using a whole bottle of wine, cooking it down, discarding the vegetables that were simmering in it,and adding more of the same vegetables. 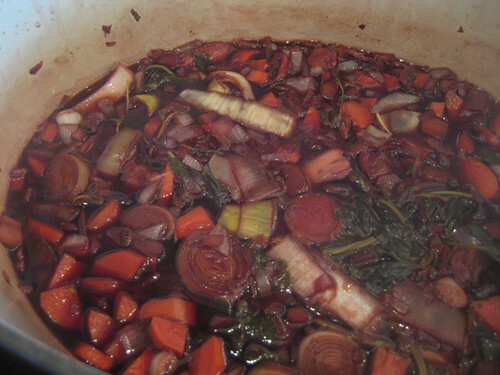 This was particularly difficult for me as some of the veggies, like leeks, were relatively expensive. 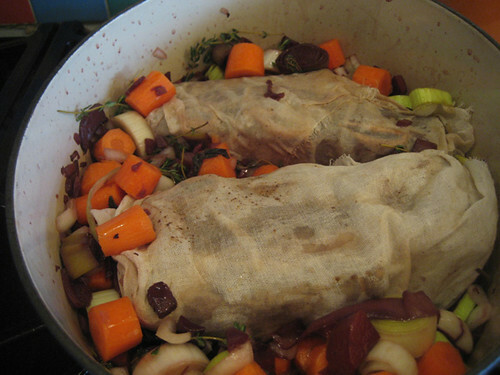 That recipe also called for the meat to be wrapped in cheesecloth, and like you, I said, ‘Okay, Thomas,’ and went with it. What really cracks me up is that he claims, in each of his books, that his method of cooking is not wasteful. Ha! I do have to say, though, that his boeuf bourguignon was one of the most amazing things I’ve ever put in my mouth. I would love to make more of his recipes, like the beef stroganoff that requires that you first make the short ribs, but I always look over them, think ‘Wow that will be expensive!’ and decide that I’m too broke to attempt it. I’ve always really wanted to make that dessert, though, and you’ve made me feel that I can manage it.